With over 3,000 full slabs of stone on premise, Architectural Justice is one of the largest stocking fabricators in Northeast Ohio. The Granite Shop artisans craft and fabricate custom countertops for kitchens, bathrooms, fireplaces and many other surface applications for both residential and commercial use. Architectural Justice’s 10,000 square foot fabrication facility brings together an experienced production team and state of the art CNC systems under one roof. Offering water-jet capabilities, precision cutting, and final hand polishing, the finished result is a product that satisfies not only our highest standards, but our customers’ as well. Granite is an igneous rock, formed by the cooling and solidifying of molten materials, composed chiefly of quartz and feldspar. Granite is one of the hardest surfaces on earth. Easy to maintain with mild household cleaners. *Sealing granite does not need to be done by a professional. This can simply be done by referring to the easy directions on the sealant. It is a matter of cleaning the surface, spraying the sealer and wiping it off. BOTTOM LINE: If you are drawn to granite, it is a perfect choice that will offer a timeless, high-end look ideal for every style. Marble is a metamorphic rock formed when limestone is buried and heated to a pliable state. The distinctive grey veins are the layers of the original limestone as they are swirled and pressed together. *Sealing marble does not need to be done by a professional. This can simply be done by referring to the easy directions on the sealant. It is a matter of cleaning the surface, spraying the sealer and wiping it off. BOTTOM LINE: If you can embrace the patina and minor imperfections marble gains over the years, consider marble. There is no comparison to the beauty of marble. Quartzite is a hard, metamorphic rock which was originally sandstone. 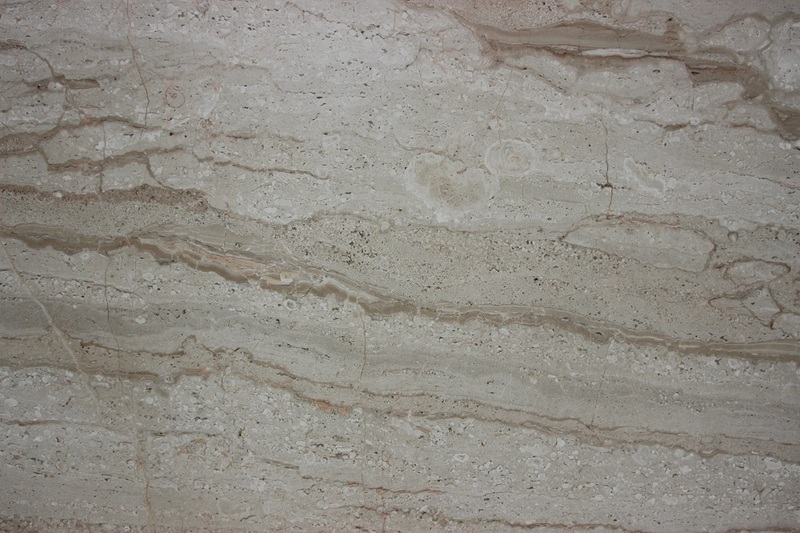 Sandstone is converted into quartzite when the sand grains are are compressed and fused together. *Sealing quartzite does not need to be done by a professional. This can simply be done by referring to the easy directions on the sealant. It is a matter of cleaning the surface, spraying the sealer and wiping it off. BOTTOM LINE: If you like the timeless look of marble but need a more durable stone for frequently used surfaces, quartzite is an excellent choice. 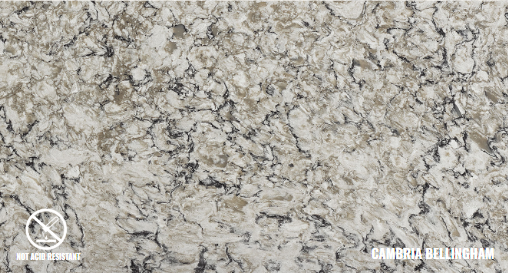 Quartz is an engineered product generally made up of 93% natural quartz and 7% resin and pigments. The price range is comparable to mid to high range natural stones and is a nice alternative. BOTTOM LINE: If you prefer a uniform look for your project, quartz or engineered products offer a nice alternative to other stones. Onyx is a sedimentary rock, formed as stalactites and stalagmites in cave interiors. 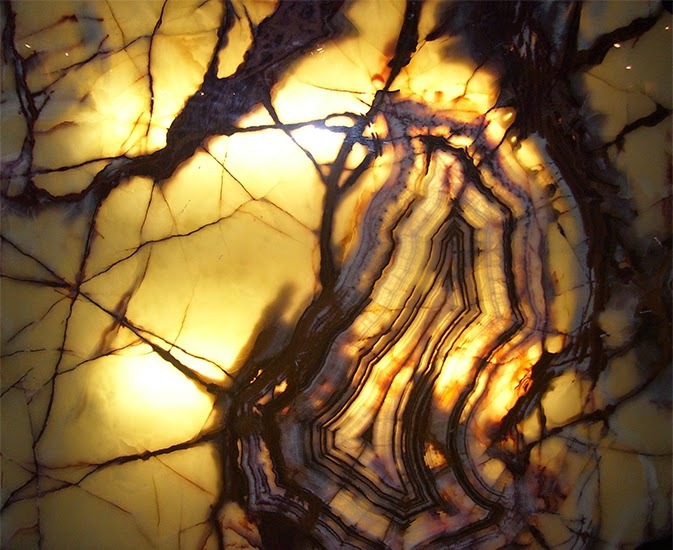 The formations contribute to the classic translucent property of most onyx varieties which make it perfect for backlighting. Is not heat proof, chemical proof or scratch proof. It is vulnerable to acids and bases, which will react with the minerals in onyx and causes etching. It is recommended for vertical applications like backsplashes and limited use in heavily used areas. Soapstone is a metamorphic rock that is non-porous. It is highly heat, stain, chemical and bacteria resistant. Unlike other stones, soapstone won’t absorb stains and discolorations, so it simply doesn’t require sealers. Stains and blemishes are only skin deep and can be removed with gentle sanding. Applications of mineral oil will remove most scratches. 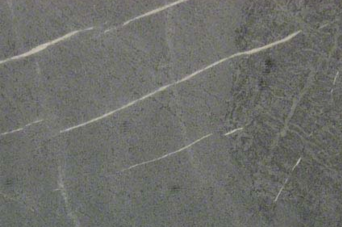 Light gray soapstone darkens over time, accentuating its gray veining. Regular applications of mineral oil enhance its beauty. Kitchen countertops, outdoor spaces and other heavily used surfaces. 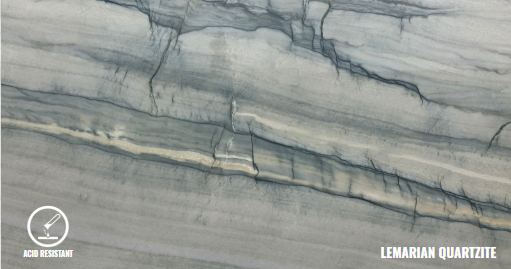 This sedimentary stone is comprised of shells, shell fragments and dissolved shells, creating beautiful veining characteristics. The porous nature of the stone requires care as staining and scratching may occur over time. It is recommended for vertical applications like fireplace surrounds and limited use in heavily used areas. *Sealing onyx, travertine or limestone does not need to be done by a professional. This can simply be done by referring to the easy directions on the sealant. It is a matter of cleaning the surface, spraying the sealer and wiping it off. 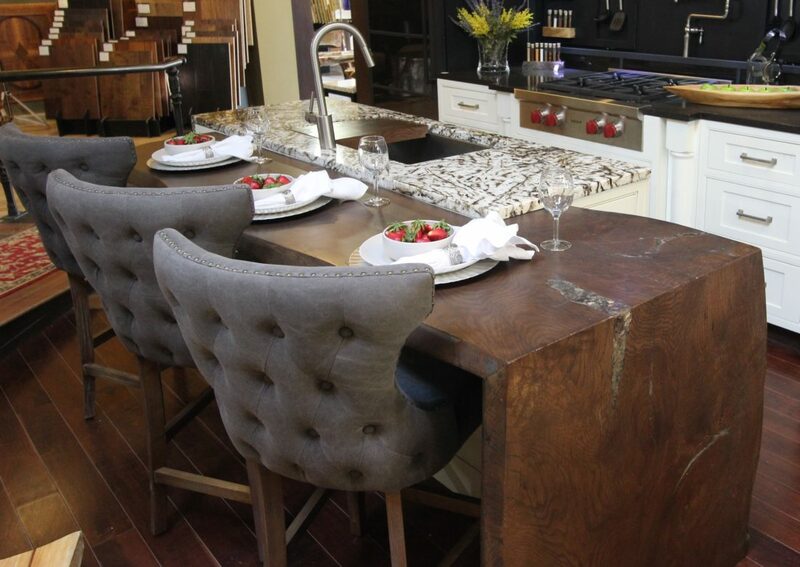 Wood adds beauty and warmth to a space and is a great accent to stone countertops. There are a variety of species that can be used, as well as live edge treatments to add to the beauty. Naturally strong and durable, but can scratch easily. Maintenance is required and should be treated like fine furniture. Bar tops or other lightly used surfaces. Mostly used for aesthetics, unless sealed properly. 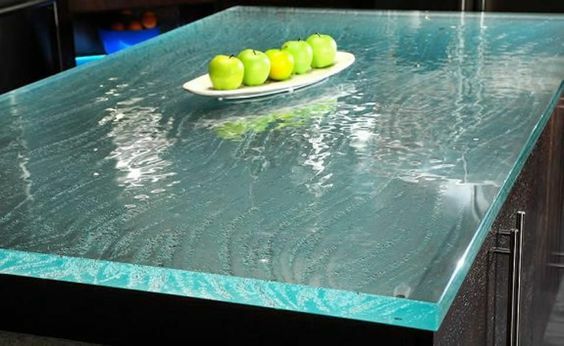 Glass countertops are gaining in popularity for not only its modern style, but also for the ease of maintenance. Glass is very hygienic and can endure heat without cracking. Glass doesn’t stain, so no sealing is needed. Many textures and colors are available along with a range of thicknesses making it a nice choice for kitchen countertops, outdoor spaces and other heavily used areas. 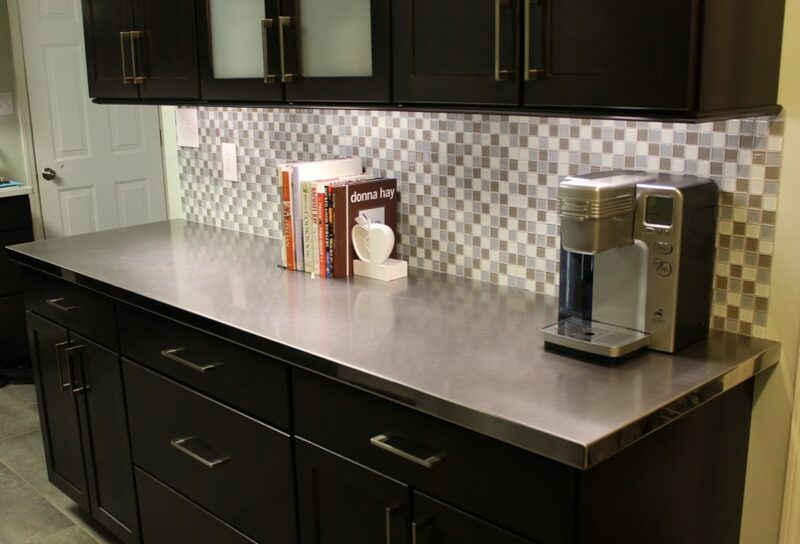 Stainless steel countertops are hardworking which is why they are often found in professional kitchens. The metal is non-porous, anti-bacterial, heat resistant and stain-resistant, but it will scratch. It is recommended to use trivets and cutting boards. Clean up is easy requiring nothing more than soap and water. Its durability makes it a popular choice for professional kitchens, bars, outdoor spaces or other heavily used areas. 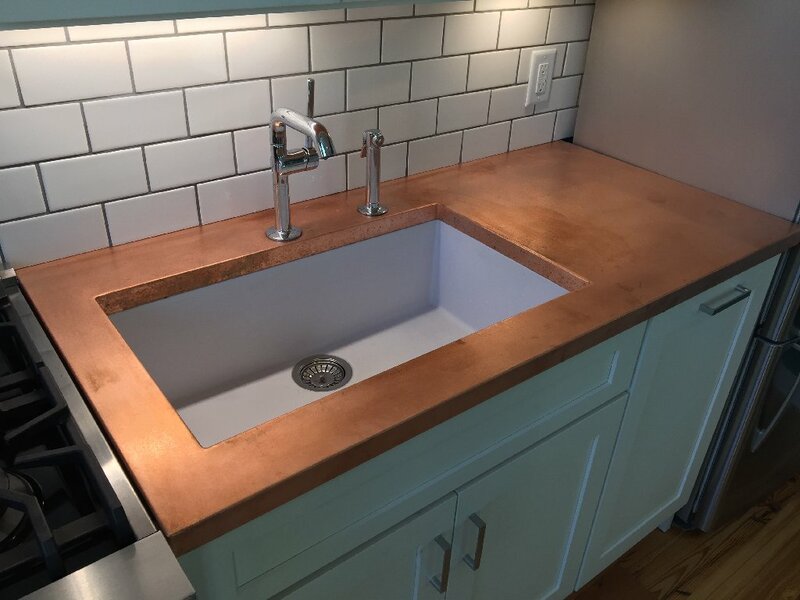 Copper countertops have a traditional or rustic look as the material develops a patina with age because it is a living metal. Copper is highly anti-bacterial, and stain-resistant but it will scratch. It is recommended to use trivets and cutting boards. Copper’s anti-bacterial properties make it great for kitchen and bathroom countertops or backsplashes. 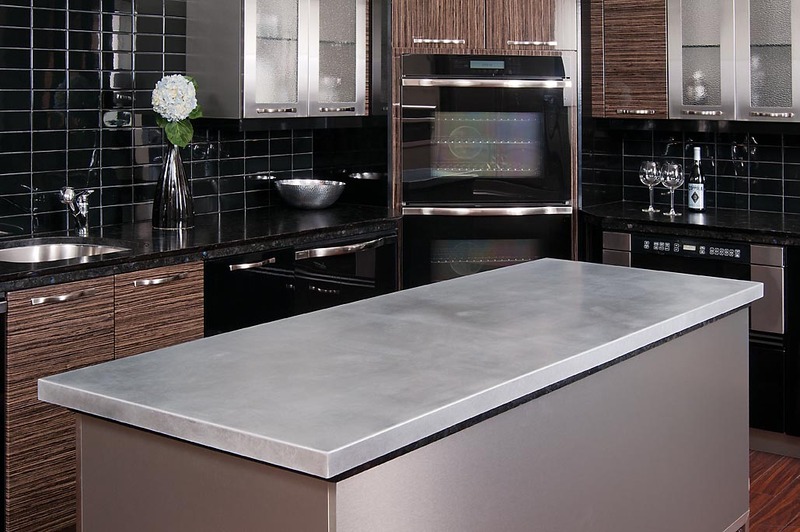 Zinc is an industrial looking countertop material that develops a patina with age because it is a living metal. Zinc is soft and will scratch easily, and is not heat resistant. It is recommended to use trivets and cutting boards. Zinc is non-porous, naturally anti-bacterial, and easy to maintain by cleaning with soap and water. Zinc’s anti-bacterial properties make it great for food prep areas like kitchens and bars. “Living metal” is a metal that changes color over time in reaction to its surroundings. In the kitchen, that means that living metal will react to acids, fingerprints, lemon juice, and all sorts of other things that land on a kitchen counter. Unsealed living metal countertops will oxidize and tarnish over time, giving it a unique and beautiful patina. In other words, kitchen spills add character. If you’re a perfectionist, then the changeable nature of a living metal is probably not for you!